Chuggington is a children's animated show aired daily on Cbeebies, join Wilson, Koko and Brewster (and their friends) as they learn to ride the rails, learn valuable lessons about friendship and working together. The trains in Chuggington are given task to complete, if they successfully complete their mission they are rewarded with a badge. Being a Mother of a child who is a Cbeebies watcher, you tend to (without noticing) watch these programs yourself, I can't remember what episode or what train's was involved but I remember one train trying to cheat/avoid a situation but they was discovered any only had to go back in the end and re-take their mission, to me that was a educational life lesson, it told me, not to lie and avoid drama's; instead try to resolve the problem. Chuggington is a positive program that I don't mind Spud watching and one that doesn't annoy me like some other children's program's that to me have no purpose for Spud to watch. 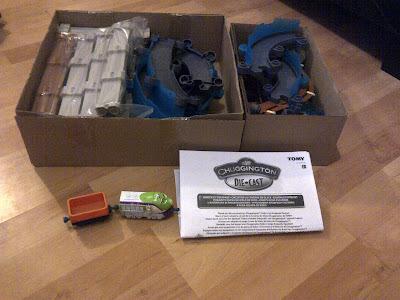 Back in November 2012 TOMY sent me and Spud a variety of Chuggington items to review (you can find these on the review page here), needless to say as Spud is a keen Chuggington viewer the toys went down well and the portable double decker roundhouse is still sat in the front room toy corner (where a lot of Spud's favourite toys live) being used on a weekly basis. When TOMY got in touch with us asking if we would like to review some of their new Chuggington Stack Track range, Spud was only too delighted in agreeing to do so. 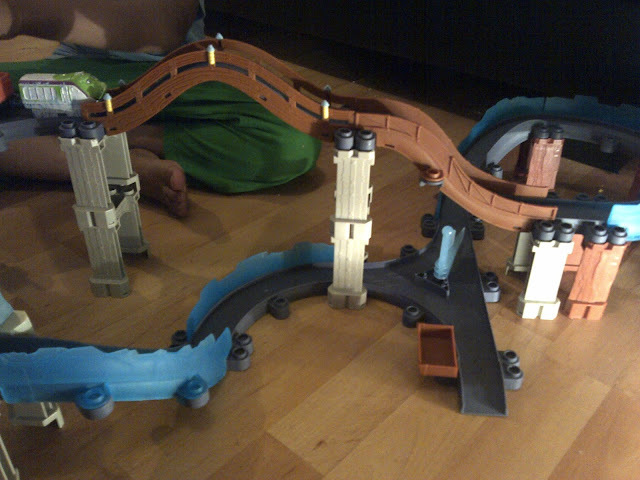 For the first time ever, you can stack your Chuggington track as high as the sky. There's no limit to how high you can go...except maybe your ceiling! The new Chuggington Die-Cast playsets from TOMY feature revolutionary track that is engineered for stability with sturdy connections, letting you build elevated layouts like never before. 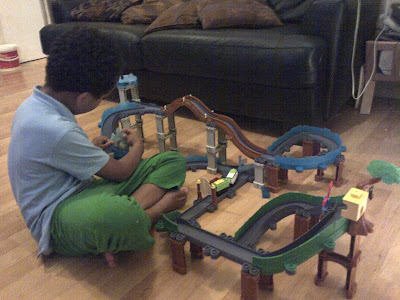 Plus, every action-packed playset can be built multiple ways, so your imagination can run wild. 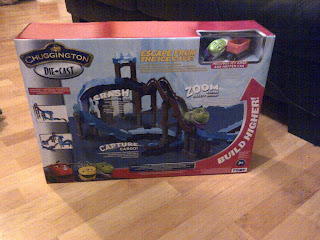 We received Koko's Ice Escapade playset, Koko's Safari Adventure playset, a Chuggington Stack Track pack which includes 15 pieces that can be added to any Chuggington Diecast playset and Old Puffer Pete. First up for review is the Koko's Ice Escapade 3 in 1 playset, Spud choose this as it was the 'most hugest box' as he told me, whilst he stared at me eagerly, given me the impression I wasn't going fast enough opening the box, he waited paitently as I got to work setting the track up. Spud was born 7 weeks premature and is slow at some abilities, with that being said, and me being a parent to only one child, I'm not sure another 7 year old would of been able to set this up alone, so I would recommend a adult helped in the set up process. I'm a typical girl, I have to study instructions properly, and worry about picking the wrong part, thankfully, although the set has quite a few pieces, it only took me 8 minutes to set up, much to Spud's delight! Included in the set is 33 playset pieces including icy Koko, a cargo car, an ice cargo loader, ice gate, cargo piece and a cargo bin. Descriptions from the box quote 'crash through the ice gate, zoom across the rickety bridge and escape from the ice cave!!! Spud quickly got to work whizzing Koko and the cargo car through the track fastening his speed to break through the ice gate and make his way to the ice cargo loader where a ice block (cargo) was tipped into the waiting cargo car, Spud then whizzes across the rickety bridge at a pace so fast, if you blink, you would miss it, he then gets Koko and the cargo back to safe land where he drops off his cargo to the cargo bin. As a parent, toys need to be rewarding, fun and helpful to my child, Spud has a squint in one eye, and Astigmatism's in both of his eyes and is under specialist care at the local hospital, watching him with his new Chuggington sets really challenged his hand to eye coordination which he dealt with really well, although the set is not awfully bright and colourful, the colours are still attractive for a child with the primary colours not being used, Spud's favourite colour is blue and he loves the unique blue which stands out in the set. Koko has real attention to detail with her icy train details, instead of just having her 'normal' train, TOMY have made her look just the part with ice particles painted onto her. Another thing I tend to question myself as a parent when considering toys is how long will it be before the toy becomes boring? 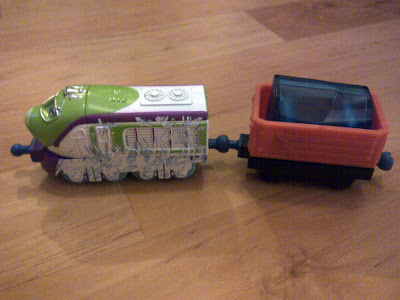 How long will it be before it turns into the Toy Story clan who get moved to the attic only to be donated or given away? 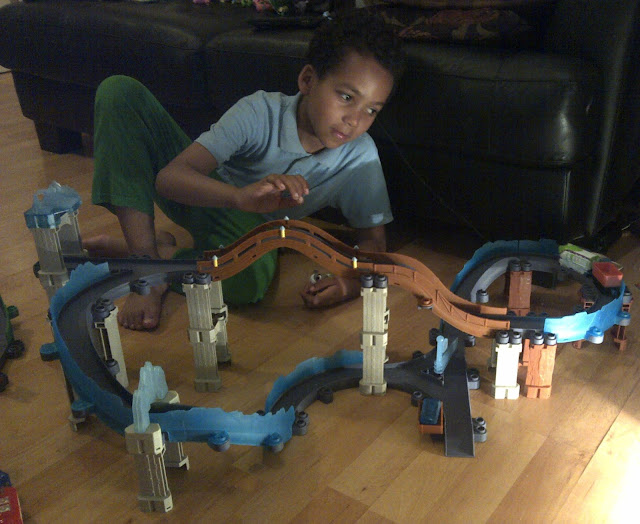 With the TOMY Chuggington range I don't worry about such, for starters the new stack track range playsets can be built in 3 different ways, 3 different layouts is 3 x as much fun for a child, and as the stack track range is compatible with other TOMY Chugginton Die Cast items, there really is no end in the growing fun! We combined the two playsets we received (this one-Koko's Ice Escapade & Koko's Safari Adventure; review coming soon) together to show you an example of what can be done. I will be doing an individual post on Koko's Safari Adventure as I believe the new range is so fab, everyone should know about it! The Stack Your Track Chuggington range is suitable for ages 3+ with this particular set retailing for around £34.99 (RRP). 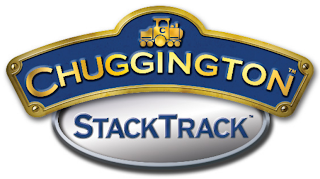 To find out more about the Chuggington Stack your Track range, check out the Stack your Track website. 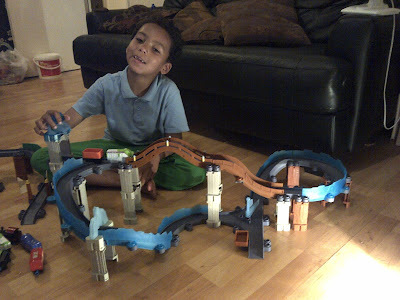 To find out more about TOMY and their fabulous Chuggington ranges plus much more, check out the official TOMY website.